ATLANTA, GA--(Marketwired - May 19, 2016) - Weekly charter service to Cancun from the Memphis International Airport recommences for the 2016 season on Monday, May 23 through August 1, 2016. "As a result of our successful season last year, we are thrilled to return to Memphis with larger planes this year with our exclusive non-stop service to Cancun," said Kevin Hernandez, VP of Marketing and Sales at Vacation Express. "Cancun is an extremely popular vacation destination," said Pace Cooper, Chairman of the Board of Commissioners for the Memphis-Shelby County Airport Authority. "The addition of a larger plane shows that Vacation Express is committed to our market, and increases the number of passengers who can take advantage of this exciting destination." In response to the interest generated locally, Vacation Express and Memphis International Airport will host a media conference on Monday, May 23rd at the Memphis International Airport in the mezzanine, above Terminal B, at 9am. Meanwhile travelers embarking on this first flight of the season will enjoy a taste of Mexico with pre-flight refreshments. Once aboard the Boeing 737 offering exclusive non-stop flights to Cancun every Monday through August 1st, 2016, passengers will enjoy a complimentary bag of pretzels, in-flight entertainment and a complimentary alcoholic beverage. All passengers are permitted one free carry-on bag and the option to upgrade. Upgrades start at only $20 each way for Preferred Seating with the option to upgrade to First Class for only $99 each way which includes amenities such as priority check-in and boarding, access to the First Class Lounge in Cancun, roomy front-row seating and a free checked bag weighing up to 44lbs. Future travelers can purchase airfare only for non-stop, roundtrip flights starting at just $399*, but most are booking 6-night packages with air and staying at all-inclusive resorts starting at $699* with kids under 12 staying free† at some resorts. Packages can be booked on line at VACATIONEXPRESS.com, by calling 1-800-309-4717 or through a local travel agent. Based in Atlanta, Vacation Express, part of Sunwing Travel Group, is a tour operator specializing in quality, affordable vacation packages to over 30 destinations in the Caribbean, Mexico and Costa Rica and most recently, Cuba. Now in business for over 26 years, Vacation Express is one of the country's largest and most trusted tour operators. Travelers looking for the most affordable, all-inclusive vacations may book Vacation Express' exclusive, non-stop packages through their travel agent, directly by phone seven days a week at 1-800-309-4717 or online at VACATIONEXPRESS.com. Exclusive charter flights are operated by Sunwing Airlines, Allegiant Air, Aeromexico, Swift Air, LLC., VivaAerobus, Xtra Airways and Volaris. See operator / participant agreement for details. Additional Notes: †Restrictions apply. Call for details. *Flight only price based on lowest season travel. 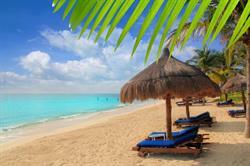 Package price reflects hotels that feature all-inclusive plans. Prices are per person, based on double occupancy. Advertised prices available for bookings made electronically or through your travel agent; small service fee of $10 applies when booking through Vacation Express Call Center. For full terms and conditions, hotel and description of all services, please refer to the Vacation Express 2016 Brochure, www.vacationexpress.com or call 1.800.309.4717. Vacation Express now accepts debit cards that offer the same consumer protection as credit cards. See operator/participant agreement for details. Public charter flights are operated by Aeromexico. All flights subject to DOT approval. Packages are limited and subject to change without prior notice. Airfares are per person, reflect lowest available airfare at time of printing, are subject to change and based upon availability of class of service. Book by 6/1/16. Not responsible for errors or omissions. Registered Florida seller of travel no. St 38441. State of California Seller of Travel Certificate of Registration #2107538-40.